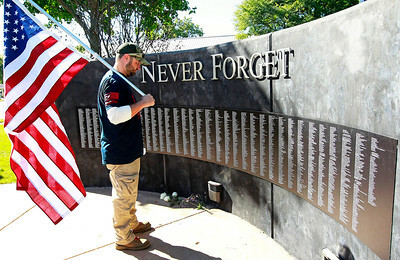 Candace H. Johnson-For Shaw Media Matt Sauser, of Spring Grove stands by the Never Forget Memorial after the Heroes of Freedom Memorial Remembrance Ceremony in Wauconda. 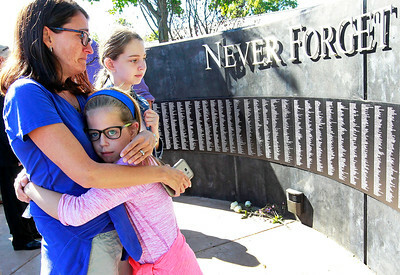 Candace H. Johnson-For Shaw Media Amanda Drummond, of Wauconda, a retired flight attendant, and her daughters, Carolyn, 9, and Kathleen, 12, stand by the "Never Forget" wall of names after the Heroes of Freedom Memorial Remembrance Ceremony in Wauconda. Candace H. Johnson-For Shaw Media Wauconda Mayor Frank Bart stands at attention while Taps was being played during the Heroes of Freedom Memorial Remembrance Ceremony in Wauconda. 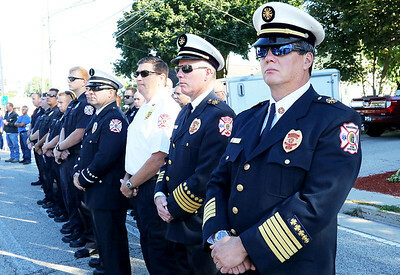 Candace H. Johnson-For Shaw Media Mike Wahl, fire chief of the Wauconda Fire District (on right) stands with several Wauconda firefighters during the Heroes of Freedom Memorial Remembrance Ceremony in Wauconda. Candace H. Johnson-For Shaw Media Commander Morgan Mann, of Grayslake with the 25th Marines, speaks during the Heroes of Freedom Memorial Remembrance Ceremony in Wauconda. 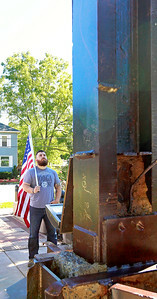 Behind Mann stands a column from the 91st floor of the World Trade Center, North Tower. Candace H. Johnson-For Shaw Media Wauconda Fire Dept. 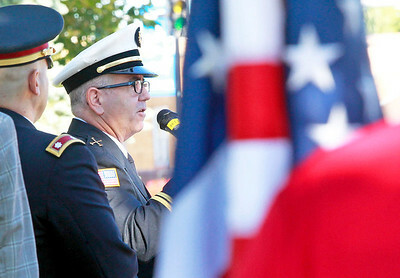 Battalion Chief Patrick Kane addresses the crowd during the Heroes of Freedom Memorial Remembrance Ceremony in Wauconda. 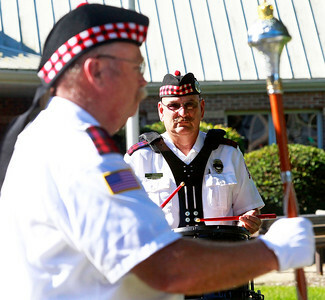 Candace H. Johnson-For Shaw Media Mark Abernathy, of Wauconda, retired Wauconda firefighter, plays God Bless America on his drum for the Northern Illinois Pipes and Drums during the Heroes of Freedom Memorial Remembrance Ceremony in Wauconda. Tom Gough, of Spring Grove, drum major, retired firefighter, stood on the left. 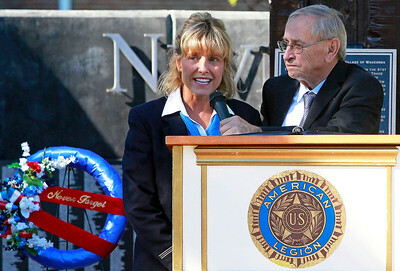 Candace H. Johnson-For Shaw Media Anita Heleszek, of Tower Lakes, a United Airlines flight attendant, speaks to the crowd after being introduced by Don Kutinac, of Wauconda during the Heroes of Freedom Memorial Remembrance Ceremony in Wauconda. Don Kutinac was on the Heroes of Freedom Memorial Committee. Candace H. Johnson-For Shaw Media Sgt. Chris Dador, Lake County Sheriff and Sgt. 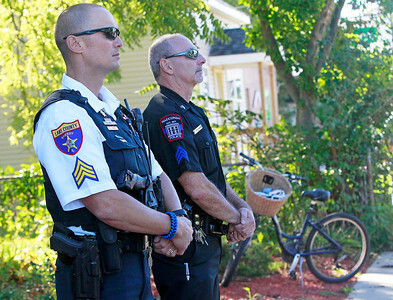 Tony Jacobson, Wauconda Police Dept., listen to the Heroes of Freedom Memorial Remembrance Ceremony in Wauconda. 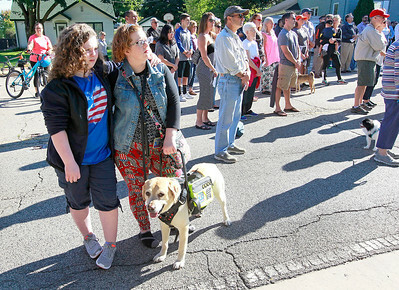 Candace H. Johnson-For Shaw Media Margaret Yost, 14, of Wauconda and her mother, Katy, with their service dog, Dune, listen to the Heroes of Freedom Memorial Remembrance Ceremony in Wauconda. 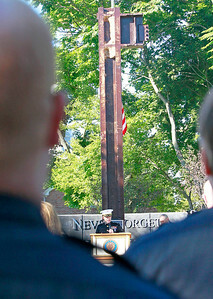 Candace H. Johnson-For Shaw Media Dan Raminick, of Lakemoor, looks up at a column from the 91st floor of the World Trade Center, North Tower after the Heroes of Freedom Memorial Remembrance Ceremony in Wauconda. 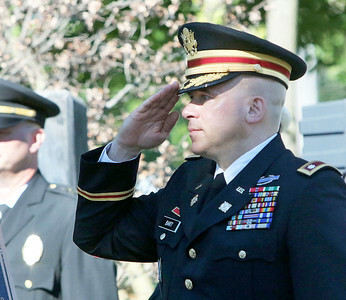 Wauconda Mayor Frank Bart stands at attention while Taps was being played during the Heroes of Freedom Memorial Remembrance Ceremony in Wauconda.